Beverly A. Wetherbie is a resident of Alexandria, VA and is retired from the business world. During the forty seven years of marriage to her husband Bob they have lived in five states as well as Germany and Thailand. Bob retired from the U. S Army as a Lieutenant Colonel after twenty six years and at Lockheed Martin as an engineer for eleven years, and now have a photography studio at their home in Alexandria. They have two children and three grandchildren. Beverly serves her local community as the coordinator of "The Crystal Dancers", a ballroom dance group, performing at retirement homes, social gatherings and malls. Each September the group performs at Springfield Mall with fifteen to twenty couples to celebrate National Ballroom Dance Week. The Crystal Dancers are the demo-team for the Mid-Eastern Chapter of USA Dance, Inc. also known as United States Amateur Ballroom Dancers Association (USABDA). She provides dance instruction in ballroom in her home and her local church. She also teaches line dancing at The Fairfax Retirement Home, Ft. Belvoir, VA.
Beverly has served the Ms. Virginia Senior America organization for the past five years, and is currently the Treasurer for the Virginia Senior America Cameo Club. 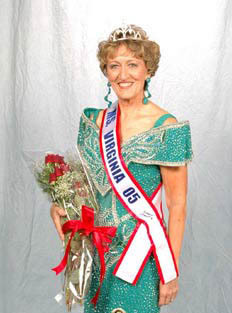 Having been a candidate in the Pageant in 2001 was awarded the Community Service Award for her work with the Crystal Dancers, and in 2004 awarded Ms. Congeniality. She is a certified Image and Skin Care Consultant with "BeautiControl, Inc.", and a member of Cameron United Methodist Church. She is an accomplished seamstress and makes many of her clothes and costumes. 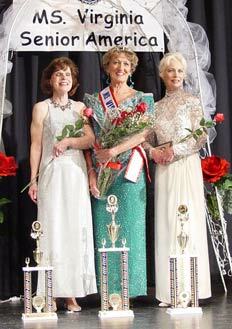 Winning Trio - (from left to right) Suzann Howe, Burke, 2nd runner-up; Beverly Wetherbie, MVSA 2005 from Alexandria; Wendy Pinhey, Annandale, 1st runner-up.